Observance of conflicts of interest policy is an important, statutory obligation of all Australian Public Service (APS) agencies, to protect APS processes (and hence the public) from actual or perceived conflicts and bias that risks undermining their integrity, as well as damaging the public's trust in the ability of public institutions to conduct their work impartially and ethically. ​NHMRC claimed that it conducted the Homeopathy Review ethically, impartially and transparently and upheld conflicts of interest policy, according to NHMRC standard processes . ​However, the formal investigation into NHMRC's procedures and methods has uncovered significant undisclosed and unmanaged conflicts of interest at multiple levels of the Review, bringing the integrity and credibility of the process into question, as well as raising serious concerns relating to NHMRC's conduct in executing the Review. On 20 December 2011, the anti-complementary medicine (CM) advocacy group Friends of Science in Medicine (FSM) was formed, announcing its open agenda to oppose the teaching of CM in universities and their practice in the community. Since its inception, FSM has actively pursued anti-CM political and media campaigns, including lobbying of the health and education bureaucracy. FSM Supporters occupy key/ senior positions within the Australian Health bureaucracy (e.g. NHMRC Council and Principal Committees, including the current NHMRC Chairman; Australia's current Chief Scientist). As shown in the 'Bias' section, even senior NHMRC officials that were not official FSM Supporters disclosed anti-homeopathy sentiment in the public domain - including the former CEO (Prof Warwick Anderson) and former NHMRC Chairman (Prof Michael Good), who declared: "As Chairman of NHMRC I can also assure you that NHMRC does not support homeopathy" during the planning stages of the Review. NHMRC therefore would have been fully aware of FSM’s anti-CM platform. "the committee or working group is chaired by someone who has no conflicts of interest that could, or could be perceived to, erode the integrity of a group decision." 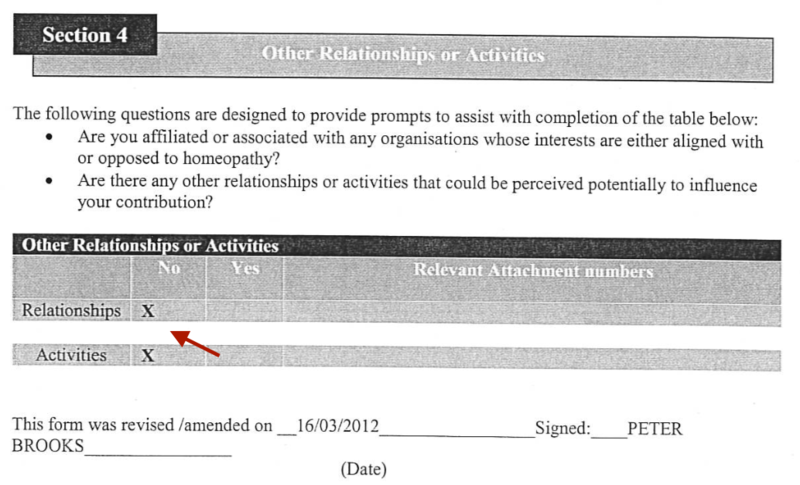 “affiliated or associated with any organisation whose interests are either aligned with or opposed to homeopathy”. On 27 March 2012, Prof Brooks updated his DOI form to disclose his FSM conflict . However, NHMRC took no action and Prof Brooks remained as Chair of the HWC and a FSM Supporter. On 28 March 2012, Prof Anderson officially appointed members to the HWC . On 12 April 2012, Prof Brooks chaired the inaugural meeting of the HWC as an active FSM Supporter. Section 42A(8): ‘A member’s disclosure, given otherwise than at a Council or committee meeting, must be recorded in the minutes of the first Council or committee meeting after the disclosure’. On 16 April 2012, he resigned from FSM , yet remained as Chair of the HWC. ​NHMRC took no action on the conflict until mid May 2012, by now half way through a first review process that was prematurely terminated under controversial circumstances (see 'The First Review'). On 15 May 2012, NHMRC expanded the membership of the HWC, to the ongoing exclusion of any homeopathy subject, clinical or research experts - in continuing breach of mandatory NHMRC quality assurance standards . FSM’s membership drive also captured several members of NHMRC Council and Principal Committees . This included members of the NHMRC Health Care Committee (HCC), which alongside NHMRC Council was involved in decision-making processes relating to NHMRC’s focus on homeopathy between 2010 and 2015. No conflicts of interest disclosures relating to Council/ HCC deliberations on homeopathy were reported for the duration of the Homeopathy Review between 2012 and 2015, despite the presence of FSM Supporters on Council/ HCC . On 30 May 2014, NHMRC contracted the Australian Research Centre for Women and Babies (ARCH), University of Adelaide, to assess additional evidence submitted during the public consultation phase of the Review . The ARCH, which had no expertise relevant to understanding and interpreting homeopathic evidence, contained undisclosed supporters of the anti-homeopathy lobby group FSM. One of these FSM supporters (Ms Emily Bain) was contacted by NHMRC to assess the additional evidence. NHMRC did not disclose any declarations of interest in relation to the conflict in its administrative reporting of the Review. The undisclosed FSM conflicts within the ARCH team exposed the process to a high risk of bias and breached APS/ NHMRC conflicts of interest policy. The reason that APS conflicts of interest policy exists is to protect government processes from being influenced by such perceived and/or actual bias. FOI requests to NHMRC have confirmed that NHMRC did not seek, nor receive, any declarations of interest from the ARCH research group relating to the FSM conflict . h) any other influences which might reasonably be considered likely to affect the expert judgement of the individual, or lead to the perception by others that the judgement of the individual is compromised." The ARCH reviewed an additional submitted 40 randomised controlled trial studies accepted by NHMRC during the public consultation phase of the Review. Of these 40 studies, 37 (93%) reported positive clinical outcomes for homeopathy. "the studies had too few participants to be able to detect differences in health outcomes between the treatment groups”. Given the unmanaged FSM conflicts associated with this process, it was associated with an unacceptable risk of bias that undermines its credibility. The ARCH sits within the Robinson Research Institute (RRI), whose former (Prof Rob Norman) and current (Prof Sarah Robertson) Directors are FSM Supporters and a long history of close affiliation with NHMRC. ​The RRI contains more than 50 FSM Supporters (a high concentration) and the ARCH, a small team of ten, contains two. One of the two ARCH members contracted by NHMRC was (and still is) a FSM Supporter (Ms Emily Bain). ARCH/ RRI documentation reveals that both contracted ARCH staffers have close links to FSM’s co-founder/ Vice President, Prof Alastair MacLennan, a long-standing research Head in the RRI. The RRI’s former and current Directors have long histories of service with NHMRC, including having served on NHMRC Council and its Principal Committees. NHMRC would have been fully aware of such affiliations. NHMRC appointed the ARCH team in May 2014, shortly after Prof MacLennan had lobbied NHMRC against homeopathy only a month earlier in FSM’s open letter of 8 April 2014. NHMRC’s lack of observance of due process in appointing such a group and its failure to declare such explicit conflicts of interest, indicates that NHMRC did not appropriately regard the conflict. It also further supports the conclusion that NHMRC did not seriously regard the earlier conflict associated with appointing a FSM Supporter (Prof Brooks) to the HWC, who was allowed to remain on the HWC without implementation of a formal management plan for the duration of the Review. The RRI/ ARCH, FSM and NHMRC are not mutually exclusive groups, but belong to the same extended medical research community. Anti-CM vested interests such as FSM have a strong presence amongst the research community that NHMRC draws from and supports. 2011 NHMRC Standard​, Requirement A.3 - NHMRC committees must include, “A multidisciplinary group that includes end-users, relevant disciplines and clinical experts”. Comparison of NHMRC Annual Reports & Friends of Science in Medicine (FSM) Supporters lists 2012-2015. No conflicts disclosures relating to NHMRC Council/ Health Care Committee (HCC) relating to homeopathy/ NHMRC Homeopathy Review deliberations recorded in Administrative Report or NHMRC Council Session minutes; HCC minutes not published by NHMRC. "NHMRC commissioned a professional research group (Australian Research Centre for Health of Women and Babies [ARCH]) to assess studies submitted during public consultation." "Emeritus Professor Alastair MacLennan co-founded the Friends of Science which seeks to put objectivity back into the analysis of many claims in popular culture regarding the efficacy of unproven substances and practices"